The remnant, called W49B, is about a thousand years old as seen from Earth and located about 26,000 light-years away. "W49B is the first of its kind to be discovered in the galaxy," said Laura Lopez, who led the study at the Massachusetts Institute of Technology. "It appears its parent star ended its life in a way that most others don't." Usually when a massive star runs out of fuel, the central region of the star collapses, triggering a chain of events that quickly culminate in a supernova explosion. Most of these explosions are generally symmetrical, with the stellar material blasting away more or less evenly in all directions. However, in the W49B supernova, material near the poles of the doomed rotating star was ejected at a much higher speed than material emanating from its equator. Jets shooting away from the star's poles mainly shaped the supernova explosion and its aftermath. 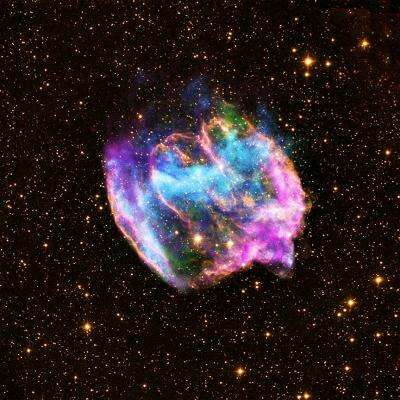 The remnant now glows brightly in X-rays and other wavelengths, offering the evidence for a peculiar explosion. By tracing the distribution and amounts of different elements in the stellar debris field, researchers were able to compare the Chandra data to theoretical models of how a star explodes. For example, they found iron in only half of the remnant while other elements such as sulfur and silicon were spread throughout. This matches predictions for an asymmetric explosion. "In addition to its unusual signature of elements, W49B also is much more elongated and elliptical than most other remnants," said co-author Enrico Ramirez-Ruiz of the University of California at Santa Cruz. "This is seen in X-rays and several other wavelengths and points to an unusual demise for this star." Because supernova explosions are not well understood, astronomers want to study extreme cases like the one that produced W49B. The relative proximity of W49B also makes it extremely useful for detailed study. The authors examined what sort of compact object the supernova explosion left behind. Most of the time, massive stars that collapse into supernovas leave a dense, spinning core called a neutron star. Astronomers often can detect neutron stars through their X-ray or radio pulses, although sometimes an X-ray source is seen without pulsations. A careful search of the Chandra data revealed no evidence for a neutron star. The lack of such evidence implies a black hole may have formed. "It's a bit circumstantial, but we have intriguing evidence the W49B supernova also created a black hole," said co-author Daniel Castro, also of MIT. "If that is the case, we have a rare opportunity to study a supernova responsible for creating a young black hole." Supernova explosions driven by jets like the one in W49B have been linked to gamma-ray bursts (GRBs) in other objects. GRBs, which have been seen only in distant galaxies, also are thought to mark the birth of a black hole. There is no evidence the W49B supernova produced a GRB, but it may have properties – including being jet-driven and possibly forming a black hole – that overlap with those of a GRB. The new results on W49B, which were based on about two-and-a-half days of Chandra observing time, appear in a paper in Sunday's issue of the Astrophysical Journal. The other co-author was Sarah Pearson from the University of Copenhagen in Denmark. I wondered if they have had time to check the surrounding areas rather than just the center of the nebula. Considering it was an asymmetrical explosion that the newly formed Black hole, the blast could have hurled the newborn black hole outward and away from its nebula. On the galactic scale a 1000 years of traveling could put it within maybe 10 light years. Recalibrating to look for it shouldn't be difficult. They already know how to do that after finding several run away stars. Their signatures are very pronounced against the background. "Most of the time, massive stars that collapse into supernovas leave a dense, spinning core called a neutron star. Astronomers often can detect neutron stars through their X-ray or radio pulses, although sometimes an X-ray source is seen without pulsations. A careful search of the Chandra data revealed no evidence for a neutron star. The lack of such evidence implies a black hole may have formed." ""It's a bit circumstantial, but we have intriguing evidence the W49B supernova also created a black hole," said co-author Daniel Castro, also of MIT. "If that is the case, we have a rare opportunity to study a supernova responsible for creating a young black hole." This is a signal that the end of the living of the stars can end to be (the small) black hole. I like to interpret that as the ultimate overheating and over pressure can change ordinary matter turning into compressed atom structure matter like black hole. The progression line is: an ideal (symmetric) collapse produces a sphere not a cartoon cloud, the axial jets leave circular holes which retract radially to the equator? Looking down the axis of rotation you would see a Hoag's object. Further lessening allows the ring material to spiral out, a spiral galaxy. This action in a massive EM field would produce a globular cluster (earlier) or (later) a smaller version of same, a bubble system. I think you have a problem of scale, the remnant mass is vastly too small for what you suggest.